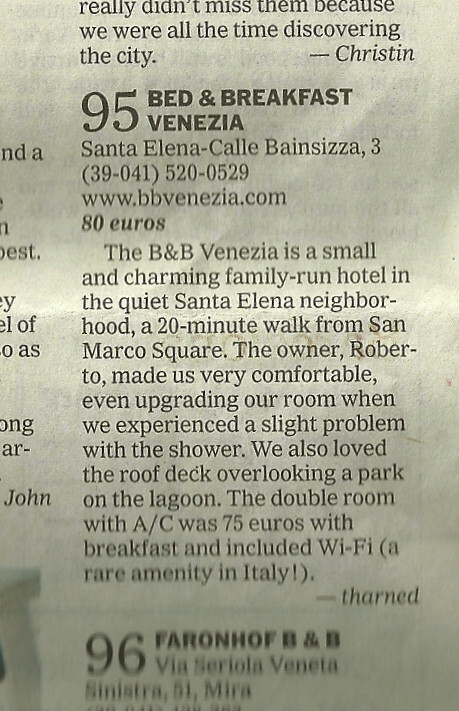 Bed and Breakfast in Venice, Italy - Our B&B is just a few minutes away from San Marco (center town), in the greenery of the quarter of S.Elena. Private bathroom, Air Conditioning, WiFi and TV in all rooms. Bed and Breakfast Venezia is located in the most verdant discrict of Venice, an island of unspoiled serenity on the eastern shore of the city's fabled lagoon. Its most delight feature, however, may be the dreamlike vision of ancient Venice shimmering across the lagoon, especially as the sun sets behind the tower of San Marco and the great dome of Santa Maria della Salute. A 10 minutes trip by vaporetto or a 20 minutes walk along the lagoon takes you to Piazza San Marco, the timeless, throbbing heart as quickly to the Lido, the site, in September, of the Venice Film Festival and its congregation of international movie stars. The Sant'Elena is easily reached by vaporetto (water-bus public transportation) (7 lines: 1, 4.1, 5.1, 6, 4.2, 5.2, N and seasonally line 82) from all areas of Venice including Santa Lucia railway station, Piazzale Roma's parking, Marco Polo Venice Airport, Murano, Burano and Giudecca.